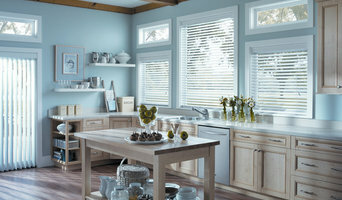 ON SALE: Custom blinds, shades, shutters & drapes for your home. Visit Linen Chest, a proudly Canadian, family owned company with 50+ years of experience and over 25 store locations. Schedule your free in-home consultation today by simply contacting us through Houzz by email or phone call. For over 50 years, Linen Chest offers custom window treatments for your home: blinds, shades, shutters, curtains, drapes and motorized blinds. 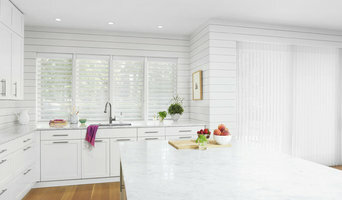 Call the experts - The Authorized Hunter Douglas Dealer. Linen Chest is Canada's top home retail destination for bed, bath, kitchen and home decor with over 25 store locations across Canada. Take advantage of our free Shop at Home Service, where our decorators will visit you in the comfort of your home to help you choose the perfect window coverings - all at no extra charge. How it works: Our decorators will provide you with a sample selection of window treatments & a price quotation in the comfort of your home. 1. Collaborate with our specialists Together, you'll look at inspiration for your room, spend time with the products and get to know the mechanics, textures and materials you like best. 2. Get an in-home consultation Let our experts do the work measuring dimensions, assessing your room's lighting and decor, and making sure your purchase is perfectly customized to your home. 3. Enjoy seamless installation Relax and let our professional technicians do what they do best. And know you're covered under our lifetime guarantee. Stores, toiles, persiennes et draperies sur mesure; découvrez l’un des 28 magasins Linen Chest, une entreprise familiale bien d’ici offrant qualité et service personnalisé depuis plus de 50 ans. With over 60 years of experience in the fabric industry and now 3 locations: Montreal, Brossard and Ottawa to serve it's clients. C&M Textiles is more than just fabrics, specializing in Home Decor services, from Window Treatments to Upholstery. Shutterblind brings the professionals and the best products to you. We specialize in Graber & Elite products. In-home decorating solutions for windows. Enjoy the ease and convenience of in-home shopping. From viewing product samples in your home, to ordering and installation, we do it all! Shopping at home is easy with our Solutions Service™ You schedule an appointment at your convenience. We bring the showroom to your home and help you with selection. We handle every step of your order all the way to final installation. We guarantee your complete satisfaction! Passionnée par mon travail, je saurai vous aider à habiller vos fenêtres, et ce, peu importe ce que vous cherchez dans le confort de votre foyer. J'aime ce qui est actuel et je suis toujours à l'affût des nouvelles tendances. J'ai aussi un faible pour les habillages de lit! En plus d'une formation constante au sein de l'entreprise, j'ai aussi une formation en décoration intérieure. Je saurai donc bien vous conseiller pour agencer vos stores, rideaux, persiennes et plus encore à la couleur de vos pièces. Welcome to our new page on Houzz! Select Blinds Canada is a leading on-line custom window coverings company which ships free from coast to coast across Canada. We provide a wide selection of top quality custom-made window blinds, shades & shutters. We back all of our products with a 100% Satisfaction and Perfect Fit Guarantee. We offer products across all different price ranges, based on the style, size and quantity of window coverings needed for your home. Cellular/honeycomb shades $50-$1,200. Roller shades $50-$800. Faux wood blinds $40-$700. Sheer shades $100-$3,000. Roman shades $100-$1,200. Bamboo/woven wood shades $70-$1,150. 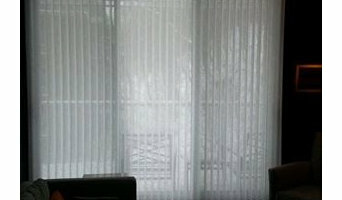 Vertical blinds $75-$2,500. Outdoor/exterior shades $150-$650. Plantation wood shutters $250-$4,500. Motorization option $100-$300+. Choose from honeycomb/cellular blinds, roller/solar shades, sheer shades, faux wood blinds, mini blinds, roman shades, wood blinds, shutters, and other popular styles of window treatments. Order free samples so that you can see how your preferred style and colour look and feel in your home. Come see why we are rated 4.8/5 with over 2,000 Google reviews. *Hunter Douglas Authorized Dealer* Verti-kal carries a wide selection of window treatments, including Hunter Douglas sheers and shadings, honeycomb shades, Roman shades, roller shades, screen shades, shutters and blinds. We offer more than great products: Whether you are shopping for a single window covering or redecorating your entire house, we have great people with the knowledge and expertise to help you put it all together. Verti-kal is locally owned and operated and serves Mont-royal, QC and the surrounding areas. We are proud of the professional products and services we provide and take our long-term commitment to the community seriously. We are here now and we'll be here in the future, when you need us again. Design et création des rideaux sur mesure! Décoratrice, spécialiste en habillage des fenêtres vous offre son service à domicile, l'estimation des coûts et l'installation sont gratuit! Fabricville has been established for over 45 years. It is the preferred destination for fabrics and custom window coverings in Canada. It offers the largest selection of fabrics at competitive prices. Ian Maxwell Inc. is an established drapery and decor manufacturer serving the Montreal design community for over 25 years. Specializing in custom drapery, bedding, slipcovers for chairs and sofas, upholstered headboards, furniture pads and decorative pillows, we have worked with many of city's finest interior designers and design boutiques. For designers, Ian Maxwell Inc. excels at turning your design ideas into reality. And for retailers, we work with you to create unique custom products that reflect your brand. We are a full service window coverings service provider. In business for over 32 years we specialize in customized Blinds, Shades, Shutters, Draperies and are specialists in Motorized applications. Boutique du Store Décoratif, we don’t simply sell blinds, we KNOW blinds! For over 30 YEARS! For a chic and colorful decor, dress your home from head to toe with our incredible variety of blinds, draperies, bedspreads, ceramics, frames and wallpapers. 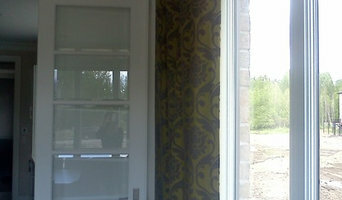 We also manufacture vertical blinds. Among our window covering materials, you will find blinds in the form of pleated, vertical, horizontal, roman, cellular and sliding panels. Well enough to match all tastes, styles and budgets. Boutique du Store Décoratif is also where you will find everything you’ll need for your floors with our sales and ceramic installation service not to mention our free measuring service! And many carpets are available! Décors Quatre Temps est une boutique de décoration établie à Drummondville depuis 1994. Nous offrons à notre clientèle une gamme complète d'articles pour la maison; literie, meubles, lampes, carpettes, cadres, tout ceci en combinaison avec notre grande sélection de matériaux de finition; tissus, moulures, papiers-peint, peintures, habillages de fenêtres, etc. Notre service de confection sur mesure et notre équipe de sous-traitants, nous permettent d'offrir un service personnalisé à nos clients! Toujours à l'affût des nouveautés, notre service de décoration saura vous conseiller, que ce soit pour les tissus, papiers-peint, agencements de couleurs, recouvrements de vos fenêtres et, évidemment, pour le choix de vos recouvrements de sol. La propriétaire, Solange René, ainsi que son équipe, se feront un plaisir de vous recevoir pour vous faire découvrir ou redécouvrir Décors Quatre Temps! décoZu c’est... ... la haute-couture d’intérieur personnalisée pour vos fenêtres et literie.